Today’s post comes courtesy of David. He has become a true master of breakfast and one of his specialties is making the best fried matzah in town. His fried matzah has become a full-fledged comfort food I crave. This designation is a very high honor that can only be achieved by a dish that is delicious, reassuring, and made on a frequent basis. I hope you enjoy learning his methods, or at least have fun drooling over the pictures. When Pam invited me to do a guest post, I was initially unsure of what to discuss. 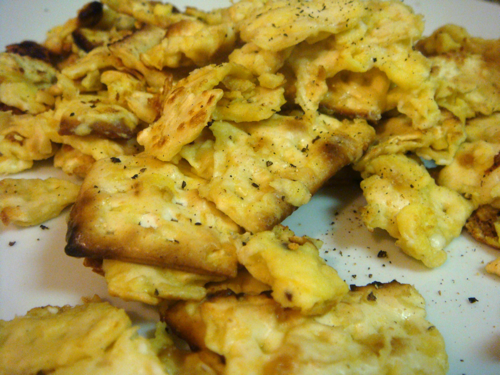 It is only natural, however, that I write about my mom’s Matzo Brei (Fried Matzo – as Pam would call it). Growing up, I remember my mom making me this delicious dish before school and even sometimes for dinner too. Some of my favorite family meals were when we would make breakfast foods for dinner. 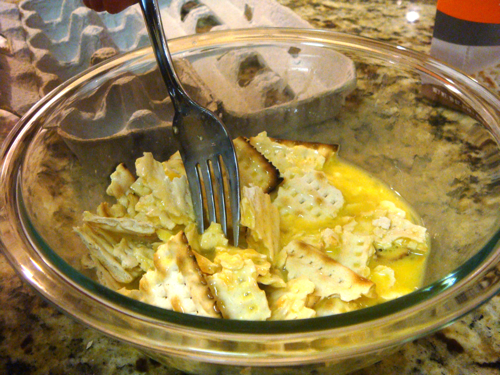 Despite this being a Passover staple, I enjoy my Matzo Brei all year long. Over time, I have altered the recipe slightly, but it is still very much the recipe that was passed down to me. I hope you enjoy this dish as much as I do. Stella loves it too when she’s lucky enough to snag a bite! 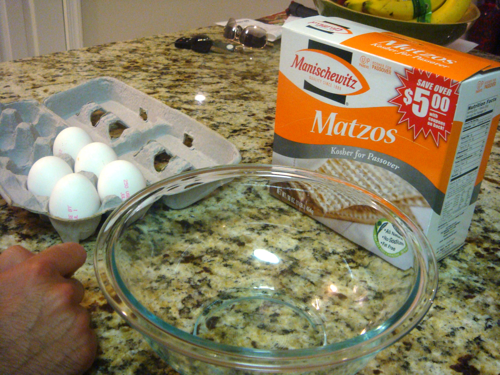 Normally, if I am making this dish just for me, I will use 1 whole egg and 2 egg whites with 1.5 sheets of matzo. Double this ratio for a double serving. Still, you should experiment with this ratio to determine what you like best. I like mine more “eggy” and Pam likes hers with more matzo. The brand of matzo I like is Manischewitz, which can be found in most grocery stores. You can buy salted matzo, but I prefer unsalted. The first thing you do is whisk your eggs in a bowl. If you want to add some fluffiness to your eggs, you can stir in a small amount of milk. 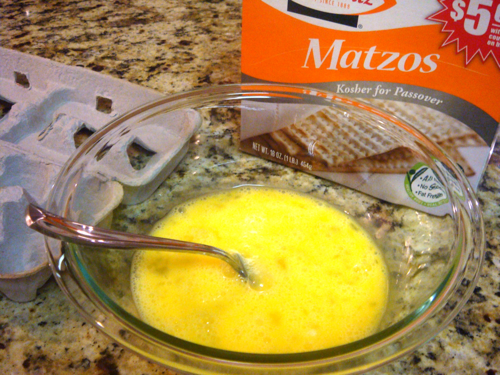 My mom used to make Matzo Brei with milk, but I have since removed this step from my recipe. Next, you want to break up the matzo into 1 inch pieces. You can break it directly into the whisked eggs and then mix all of it up. 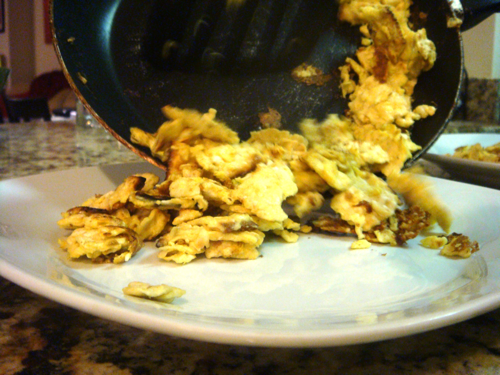 Pour this egg/matzo mixture onto a non-stick pan. You may need to use cooking spray. 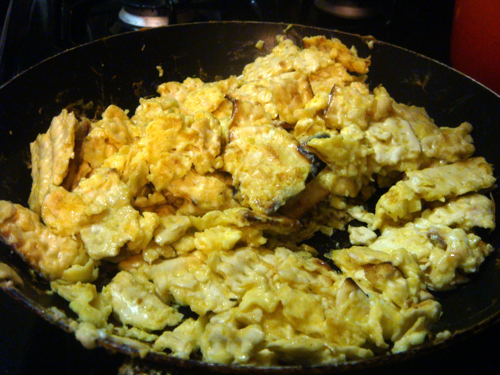 With the pan over medium to medium-high heat, frequently stir your eggs as if you were scrambling them. You can let the eggs brown slightly on the pan, but be careful not to let them sit on the hot pan too long without stirring them. I personally like my eggs well done, but you can adjust the length of cooking time to satisfy your preferences. This 10-minute meal is irresistible! Don’t be shy to add salt, pepper, ketchup, maple syrup, or any other condiment you enjoy with your eggs. I find pepper to be enough for me. Pam likes dipping hers in margarine (yuck). I hope you enjoy this recipe as much as I do. Please let me know what you think. Enjoy!